You can rise early with worry and go to bed exhausted. You can carry the weight of the work you do, the life you live and carry it squarely on your own shoulders. The more you do, the more than must be done. The more you succeed, the more you must succeed. The best you did last week pales in comparison with the best you must do this week to keep your head above the water of whatever sea you are sinking in. 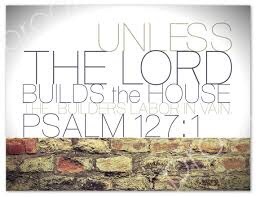 Unless the Lord builds the marriage, the ministry, the job, the life…. How does God do this? For me, the answer involves surrender, obedience, getting out of the way and asking God to show me a new way to build. A new way to live. A new way to love. A new way to lead. Not the world’s way, not the ways I know from experience but his. I ask Jesus everyday to show me the why, the how and the way he builds lives, the way he loves and the way he leads. May you get out of your own way today. May you surrender your “this is the way I’ve always done it” for “Jesus show me a new way”. May you obey and put into practice what God shows you. May today be the day that you love a little bit more like Jesus, lead a little bit more like Jesus and allow yourself to rest a in his grace a whole lot for it.